With the Diwali festival starting on November 13th, we begin the worldwide holiday season, with Hanukkah, Christmas, Festivus, Kwanzaa, Las Posadas and a variety of New Year's celebrations to look forward to. If you're thinking about giving a meaningful gift to someone special in your life, it is not too early to start giving it some serious thought. So this month we share our ideas on the best values in fine gemstones. Undoubtedly many of the gifts bought this year will be the latest smartphones and tablet computers. We're as fond of our electronic gadgets as anyone, but we also have a drawer full of obsolete technology, some only a year old. Fine gemstones are a very different kind of gift -- formed by lucky accidents of nature millions of years ago, they are often treasured by families for generations. In the colored gemstone world, there are certain gems which have a good record of increasing in value over time. At the top of the list is Burma ruby. These rubies have always been rare, but now production from the Burmese mines has declined and new rubies over 1 carat are non-existent. Ruby prices continue to rise, not only for Burmese stones but for the better African rubies as well. 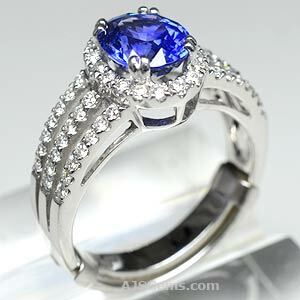 Sapphires are not as scarce as rubies, but sapphires with top color in larger sizes are still very rare. Fine blue sapphire tends to hold its value best, though rare pink, yellow and padparadscha specimens can be equally valuable. Blue sapphires in larger sizes are especially sought after by collectors, as are blue star sapphires over 10 carats. Top quality jadeite is another Burmese gem that has seen rapidly rising prices, due to strong demand from China. Spinel has long been a favorite of gem dealers, who regard it as highly as sapphire and ruby. When some very unusual neon pink-red spinel was discovered in Mahenge, Tanzania in 2007, spinel became one of the hottest gems in the market. Mahenge spinel has already become a rare collector's stone. There are several other gems that can be classed as investment grade stones: alexandrite, imperial topaz, the rare garnets (demantoid, tsavorite and spessartite) and paraiba and rubellite tourmaline. For gem collectors, any rare and beautiful gem will be appreciated -- exotic gems such as sphene, gem silica, jeremejevite and pezzottaite make interesting gifts. In 10 or 20 years when most holiday gifts of 2012 are long forgotten, a fine gemstone will still be a treasured possession. This month we feature fine jewelry from the AJS Collection. From time to time we work with custom jewelers in Bangkok to set some of our finest gems. We offer these to our clients or put them up for auction at Sotheby's or Christie's. These pieces features the finest material and the finest workmanship. We'll hope they'll inspire you to create your own custom jewelry with a fine stone from AJS Gems. This stunning ring features one of our finest Brazilian alexandrites, a gorgeous 2.03 ct pear with a strong color change, certified as natural and untreated by GemResearch Swisslab (GRS). Set in 950 platinum, this custom ring features a halo of white diamonds, with amethyst accents set in the band. An elegant pair of Burmese jadeite dangle earrings, set in 950 platinum with 78 diamonds. These earrings feature 8 pieces of fine jadeite with a total carat weight of 6.92 carats. All of the individual jadeite stones have been certified as A-Jade (natural and untreated jadeite) by the Gem and Jewelry Institute of Thailand (GIT) and the certificates are included with these fine earrings. A brilliant 2.44 ct Nigerian spessartite pear, set in an 18k white gold pendant. Set off by 25 white diamonds with a total carat weight of 0.33 cts. We also have a pair of spessartite garnet and diamond earrings. 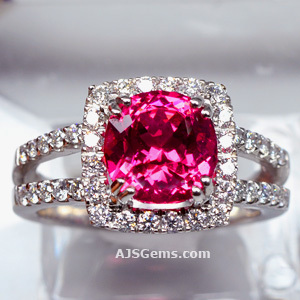 A vivid Mahenge spinel set in an 18k white gold ring with a diamond halo. This gorgeous 3.10 carat neon pink spinel is set off by 40 sparkling diamonds with a total carat weight of 0.57 carats. The split shank setting adds to the elegance of this fine piece of jewelry. The spinel is certified as natural and untreated by GemResearch Swisslab (GRS), with the color identified as "pinkish red". A lovely 2.14 ct Ceylon Sapphire set in an 18k white gold ring. This fine sapphire is set off by 60 white diamonds with a total carat weight of 0.67 cts. A large blueish-gray Burmese star sapphire set in a 14k white gold ring with with 2 significant diamonds (total carat weight about 0.50 cts). Completely natural and unheated. We usually exhibit at the GJX show in Tucson each year, but for 2013 we'll be doing the Pueblo show as well. We'll be at GJX, Feb 5-10, in booth #2300. We'll be at the Pueblo show at the River Park Inn, Feb 2-14, in show room #146. We look forward to seeing you if you plan to be in Tucson. According to an article in Optics Express, scientists at the Optoelectronics Research Centre at the University of Southampton, UK report they have discovered a method that can make metals appear to be different colors. The method embosses tiny raised or indented patterns called nano-patterns onto the metal’s surface, which changes the way the metal absorbs and reflects light. Though gold can only be modified to appear red or green, silver can be modified to show any color. Since the technique doesn't change the chemical composition of the precious metal or involve any alloys or coating technology, it is expected to be of interest to the jewelry industry. Our gem photos and videos are taken under magnification to show as much detail as possible. Because website photos are viewed on different size devices -- computer monitors, tablets and mobile phones -- it is not possible to produce lifesize photos. That is why we provide the exact dimensions in millimeters for all our gems, in the form of length x width x depth. Is the "padparadscha" color only found in sapphire, or can it be found in other gems too? The term padparadscha is reserved for the natural pink-orange color of sapphire. You can read our article on the history of padparadscha for grading criteria for these rare stones. 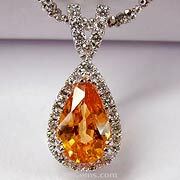 But similar colors can sometimes be found in spinel, tourmaline and morganite, so if you love the delicate pink-orange color, it is possible to find it in other gem varieties.